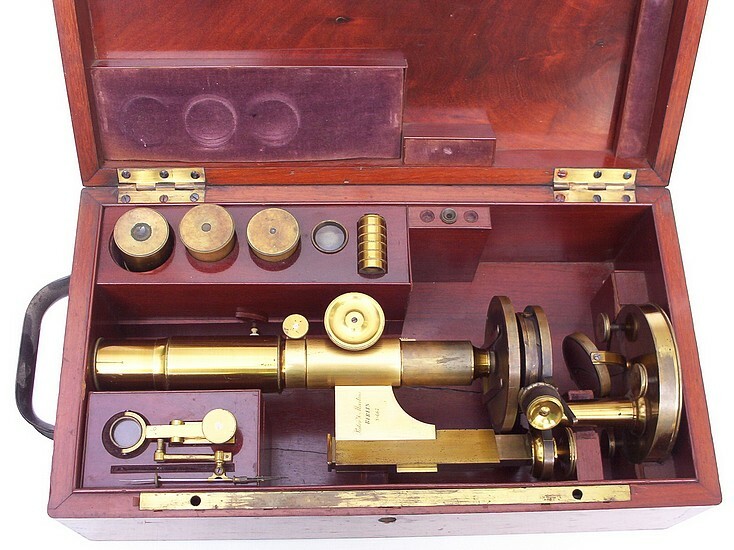 This microscope is equipped with a six component objective lens where various combinations of the components can be used to vary the magnification. It is also supplied with four eyepieces, a Schiek type compressor, stage forceps, one (of originally three) aperture stops, a live box, and a sub-stage aperture wheel with one aperture containing a screw-in condensing lens. The glass surfaced stage has orthogonal calibrated motions and is capable of complete 360 degree rotation along the optical axis. Located under the stage is a lever that can raise or lower the aperture wheel. The circular base has three leveling screws. The microscope is signed on the limb: Pistor & Martins, Berlin, No. 667. Carl Philipp Heinrich Pistor (1778-1847) began production of scientific instruments in the early 19th century. By around 1824, Pistor was in a partnership with Friedrich Wilhem Schiek (1790-1870). The firm Pistor & Schiek lasted until 1836 at which time Pistor worked alone until he established a partnership with his son-in-law Carl Otto Albrecht Martins (1816-1871). The firm continued under the name Pistor & Martins until it terminated in 1873. 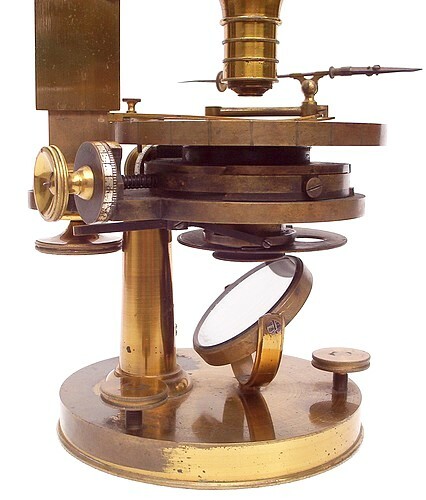 Pistor & Martins are best known for their astronomical and navigation instruments while the microscopes made by the firm are less well known. For a history of this firm (in German) link here.